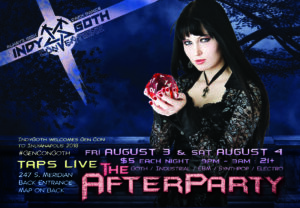 #GenConGoth IndyGoth Conventions Presents 2 NIGHTS of ‘The Afterparty’ on Friday Night August 3rd, and Saturday Night August 4th, of Gen Con Indy! 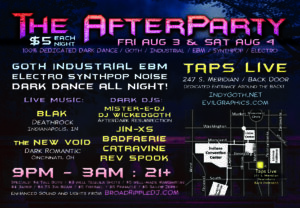 Low-cover, improved space, just 100% Dark Dance (No mainstream BS) mayhem. No badges necessary, wear what you wish!